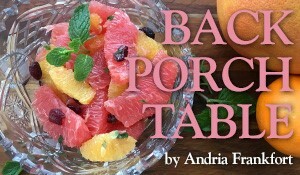 On a cool fall morning last year, Sharon Brier and about 40 girlfriends piled onto a bus carrying boxed lunches from Central Market, ready to embark on Sharon’s birthday escapade. Soon, the women found themselves in a part of Houston they barely recognized: East End’s Smither Park. “As soon as we got off the bus, everyone was running around taking pictures,” Sharon recalls. “I’m not even 100 percent sure where we were,” says Sharon’s friend, Patsy Segal, who has lived in Houston her whole life. Patsy isn’t alone on this one. Though I grew up in Houston, I had never heard of Smither Park until I began exploring the East End, a roughly 16-square mile neighborhood spanning from east downtown’s BBVA Compass Stadium to the Port of Houston on the west and Hobby Airport in the south. Tucked away on Munger Street, Smither Park’s half-acre green space is an artist’s paradise. On one end of the whimsical park stands a fish-shaped amphitheater used for dance, film and musical performances during the year. The other side houses a dragon-themed swing set. 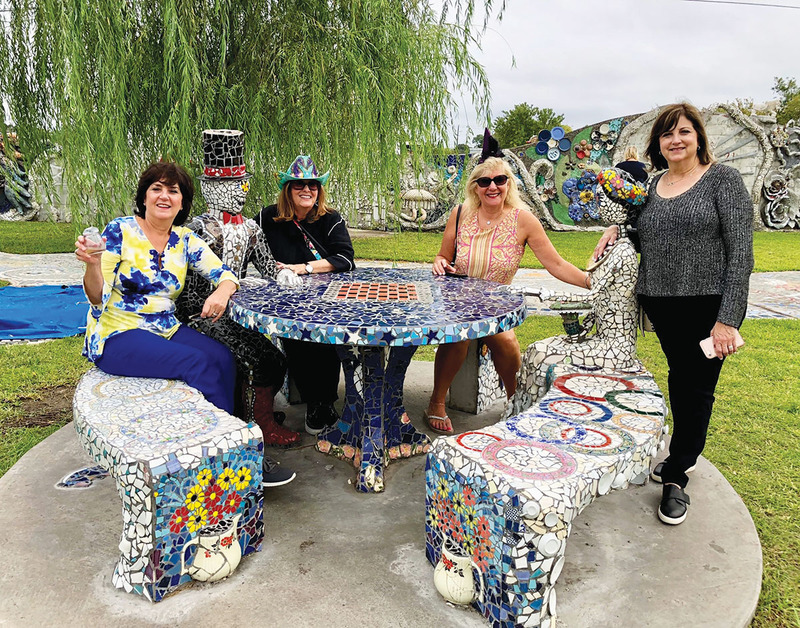 All along the eastern edge of the park stands a 400-foot-long memory wall, with colorful mosaics made from broken ceramics, tiles and seashells. “It’s kind of like Gaudi Park in Barcelona,” says Sharon, a Buzz writer and real estate agent, likening the mosaic paths and colorful tiles to the Spanish World Heritage Site. 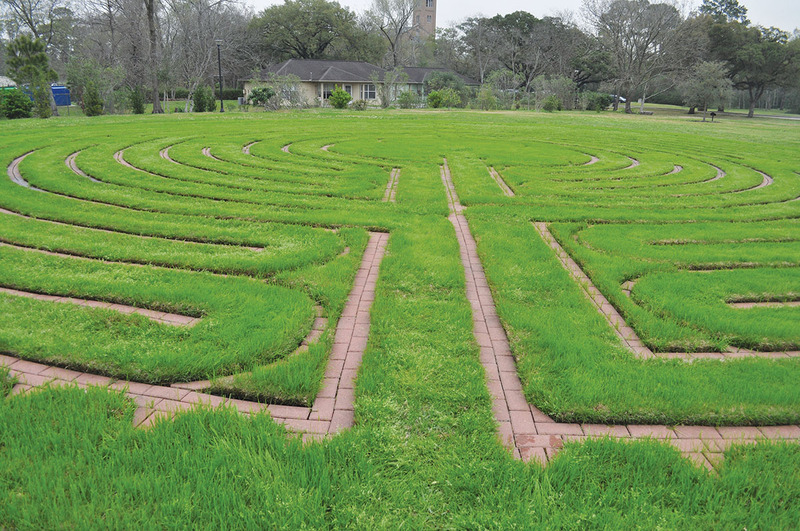 Modeled after the labyrinth in the Chartres Cathedral in France, the stone path stretches 84 feet in diameter on a grassy expanse behind the chapel and takes about 25 minutes to complete at a leisurely pace. Not to be confused with mazes, labyrinths have one path in and one path out, so no getting lost. Sharon said she only found the spot because she was specifically seeking out labyrinths. “It’s not on the beaten path,” Sharon says. For Frances Dyess, president of the East End Chamber of Commerce and a graduate of the neighborhood’s Milby High School, the East End is home. “I just love to show this area off,” Frances says. Frances drives past condominiums that have replaced older homes and industrial buildings. She points out a taco joint on nearly every corner. We’ve seen at least 10 taco spots before we pass the Original Ninfa’s on Navigation – a Houston institution that introduced fajitas to our collective Tex-Mex consciousness. The best tacos are at La Reynera, Frances says. At this hole-in-the-wall bakery/taqueria, just down the street from the East End Athletic Club on McKinney, rows of fresh Mexican pastries greet visitors. Like many businesses in the East End, La Reynera is run by Spanish speakers, so knowing the language is a plus. La Reynera offers limited seating – just a few bar stools – so visitors can take the tacos to go and find a picnic table at the nearby Mason Park, another place Frances frequents. Located at South 75th and Tipps streets, the 104-acre green space offers lakefront views and hilly running trails far less crowded than Memorial Park. The park has baseball/softball fields, six tennis courts, a swimming pool and a community center that offers after-school and summer-session activities for kids. Since 2006, the park has also served as a flood-control project, and 3.5 acres were developed as a wetland environment. As Frances drives through the East End, her commute is dotted with bright graffiti and street art on buildings, storefronts, even electrical boxes. A hub of street art is the Harrisburg Art Museum (HAM) at 4200 Harrisburg Blvd. 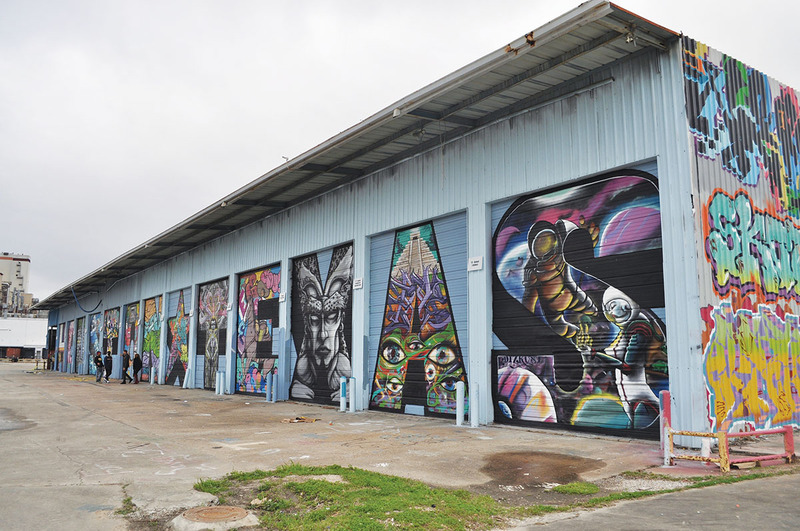 Tucked between railroad tracks on one side and the metro on the other, this graffiti art-covered warehouse showcases street art curated by local artist Daniel Anguilu. The public-facing side shows a range of subjects, from animals to nature, while the back side features lettered bay doors spelling out “Houston, Texas.” Each letter was created by a different local artist. The East End now seems like a mecca of graffiti – one area is even called “graffiti park,” since every inch of wall space is covered with paint. But it hasn’t always been this way. 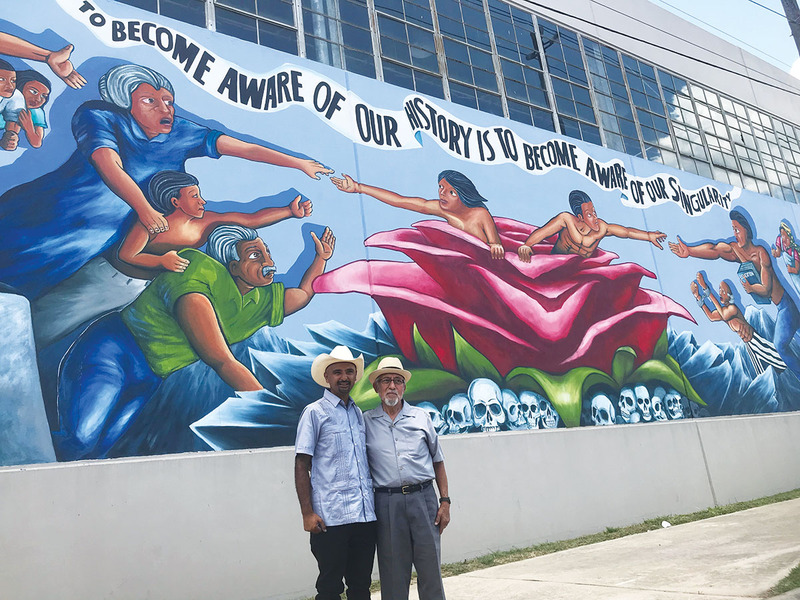 Houston-based artist Gonzo247, Mario E. Figueroa Jr., who made the iconic “Houston Is Inspired” mural on the south wall of Treebeards restaurant, grew up on the East End in the late ’70s, a time when the neighborhood offered one piece of street art: Leo Tanguma’s “The Rebirth of our Nationality.” The 240-by-18-foot painting, on the side of the old Continental Can Factory building on Canal Street, depicts the struggles of Mexican-Americans to overcome racism. “Graffiti has gone from being unknown and feared and unwanted to being embraced, accepted and in demand,” Gonzo says. Last year, Gonzo and his team refurbished Tanguma’s landmark painting. 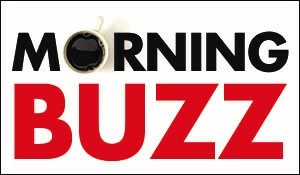 Gonzo recommends the food trucks at Truck Yard, Suko’s Burger House and La Victoria Bakery – known for Mexican specialities such as pastelitos de dulce de leche, pastries stuffed with rich caramel. “There’s really so many great places, but the best way to find those hidden gems is to go explore yourself,” Gonzo says. Sharon’s friends plan to do just that. Editor’s note: This article is the first of a three-part series exploring different parts of Houston. Next up: the Third Ward, followed by the Greater Heights. Earlier this year, Houston made it onto the New York Times’ list of “52 Places to Go in 2019.” Buzz writer Pooja Salhotra checked out Houston spots with Times reporter Sebastian Modak, who is spending the year exploring the 52 destinations on the list.